Its definitely not the softest duvet, but its light and breathable, which is what I wanted. I like the soft wrinkle look of the fabric. It washed up really nice, too. Enjoy a cozy night with this duvet cover set. Crafted from 100-percent cotton, the soft set provides comfort and warmth. Available in a range of soft colors to complement your decor, the set provides an elegant foundation for your bedding. This is just what I wanted. Had been considering a linen one then decided on this as it was similar but easier care perhaps. I was right! It has the rumpled look which some people may not like. It washes and dries beautifully and is nice and soft. With this on my duvet I don't use a top sheet or blanket and I'm nice and cozy. The color I chose is the light blue and it is light blueish grey which works fine for me. Good product. It does have ties in side each corner to anchor the duvet. This duvet cover is super soft and feels like it costs 3X what I paid for it - I compare it to a belgian linen. I got the light blue color and it looks great with my decor as well. The zipper makes it easy and quick to put my down comforter inside. This was my first duvet cover. I am very happy with it. 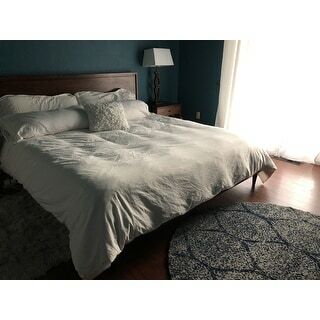 I ordered the blue/ king duvet cover. I like the wrinkle look it has. I also like the zipper feature since most seem to have buttons. This cover does have ties to tie to my comforter. I didn’t see them at first when I put it on before I washed it and decided I wanted to keep it. 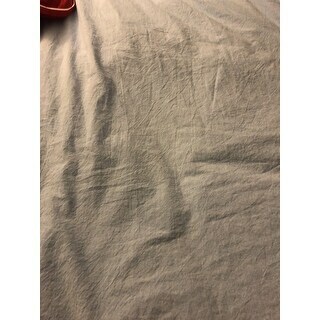 I had to convince my boyfriend why we should buy a “ pillowcase “ for our *** comforter we just bought that is dry clean only. He thinks it’s a good investment now. I love the color. I would recommend this to anyone. I plan to buy another in a different plot. It washed real well and easy to put on. I thought it had a different texture but got passed it pretty quick. Absolutely love this duvet cover!! The cotton is of a "just right" weight - not too thin and not too heavy, with a lovely soft hand. I also love the fact that the fabric was not neatly pressed and starched, but rather was naturally mildly rumpled, which I realize may not be pleasing to everyone. I found this item to be very much as described, although I purchased the off white color and cannot vouch for the accuracy of the colors. Very good quality duvet. The shams are not as pictured. They have a 2-inch fabric border all the way around, which is why I gave it 4 stars instead of 5. But do not regret the purchase at all. Soft fabric that washes well. Beautiful colors too. I purchased the Lite Blue color set and it looks exactly as pictured. A very pretty color and creates the beautiful, wrinkled look I was going for. My only gripe is that I have a 12-inch memory foam mattress, so the cover does not quite flow over the sides as I expected it would. It's just a little short. Still looks pretty, but would have preferred it to be a little longer on the sides. I am happy with my duvet cover set. Absolutely love this duvet cover! The color is a very very pale blue. Almost not noticeable depending on the light. It matches my room perfectly for a calming feel. The natural cotton is wonderful and so comfortable. I stuffed two comforters into it and it created a nice, overplush, heavy blanket. During the summer I will definitely only use one comforter. 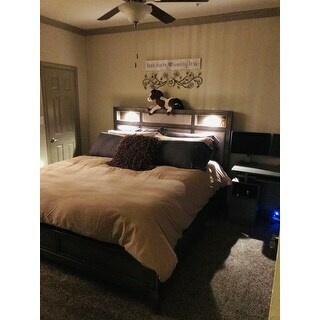 I bought a queen and it fit both comforters perfectly, it is definitely more of a full/queen size than an actual "queen" if that makes sense. I would suggest measuring the blanket you are trying to cover. Love this. Got it in blush and almond. Sheets and duvet covers and pillowcases. And I can’t find my blush sheets and pillowcases anywhere. I am so frustrated I’m going to order some more. I’m always skeptical of buying something like this online without the ability to see and feel the product in person. I’m very happy with this duvet, it feels and looks great and I love the quality and even the packaging is nice. 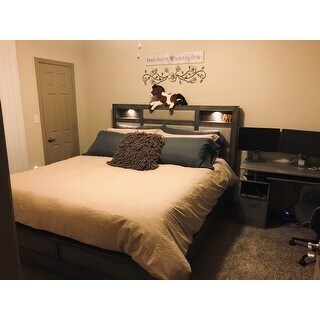 I purchased the Ash Gray for my Queen guest bedroom and I am now considering buying the king white duvet for my king in my master bedroom. I believe it’s out of stock now but hoping they update the availability soon. Love the color but was hoping it would be softer. Looks great in my room. Waiting to add duvet filler after summer. Love this! I’ve had two problems with it. First, one of the shams had some rust-colored imperfections. I called Overstock and they immediately resolved the issue - I will be sent new shams. Second, the fabric isn’t very heavy. Not thin enough to look cheap. However if you’re wrestling a king-sized down duvet into this, it is possible to rip a seam, as I did. Easily repaired. 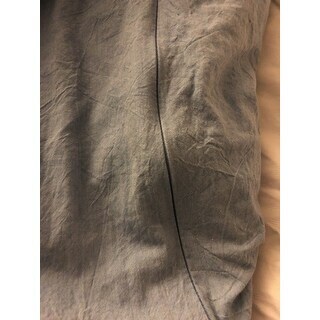 The good- I think this duvet is SUPER cute and comfy, and I love love love the wrinkled look. It is so cozy and inviting in my opinion. The bad- when I turned it inside out to tie it to my duvet insert, one corner was a bit unraveled and didn't have the tie (all the other three corners had the tie). That was annoying and disappointing and makes me wonder if this will fall apart in the wash. That being said, I've been re-doing my room and am so over online shopping I did not feel like sending it back and exchanging/returning. Also if you're wondering about the color: hard to tell from the picture but I would call it like a blush-y beige. I think it is a bit darker in person than it is online. 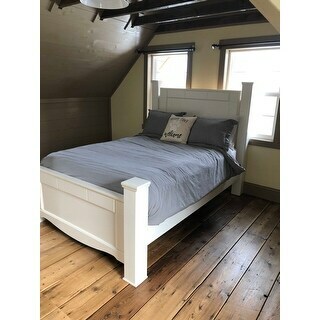 It coordinates really nicely with my cream headboard and bench and brownish beige rugs. Giving it 4 stars because I still think it's super cute. Quality is awesome!! But to big for the full size down I bought . I’m so in love with this set! 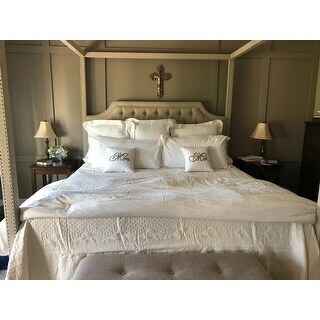 I ordered grey and light blue which turned out perfect in my guest rooms. The zipper closure keeps the insert tightly in place. My daughter is in LOVE with this duvet. It is super soft, and a nice shade of lavender. We got the full/queen sized cover, and it fits perfectly the full size insert we had - not too tight, and not too loose. I highly recommend! LOVE! This duvet cover is so amazing on our king bed! Easy to clean when necessary and super comfy and cute! Very soft duvet cover! Love the color I picked! I love these sheets! They're soft and beautiful without looking wrinkly or sloppy. I love it!!! this is exactly what I was looking for with the prewashed wrinkled look. it has ties in the corners to attach to your duvet. the almond color does have a very slight pinkish tone to it but its still more on the side of beige. feels really nice and looks high quality. This duvet cover is everything I expected, it's rustic beauty and extraordinary comfort make it the precise look that i was going for. The relaxed fabric looks great in my guest bedroom. a true find that I had been searching for on other big box stores. Overstock has once again come through for me. Love it!! so beautiful and cozy! I love it! Washes well, has ties to keep comforter in place. This cover set was exactly what I was looking for. It is soft and has that high quality hotel feel. It is a soft white, not quite ivory, definitely not pure white. We stuffed and folded it at the end of our bed. "Dimensions of king and cal- king?" "Is off-white the same as white? Or, what is the difference?" Yes, they are the same color. "Does this come on all white in queen size?" 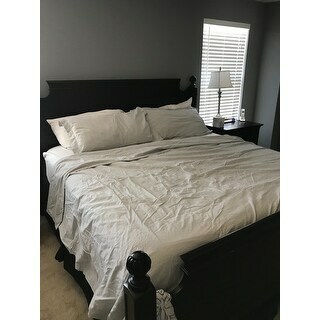 Yes, the white is available in queen size. 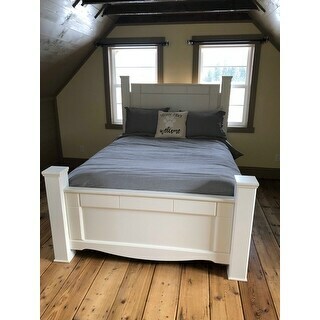 "Thinking of buying the Ash Grey bed set, but I'm hesitant. My question is does the cotton pill up and get bumpy." No it doesn't. We are very pleased with the quality. I have washed it at least 3 times and have had absolutely no issues. 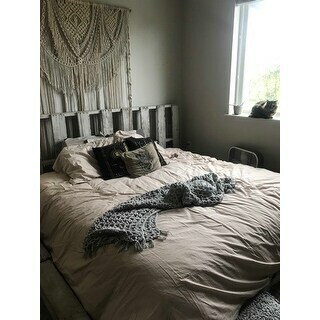 "Where can I buy the yarn dyed pillows that are shown with the bedding? Can you buy an extra set of the shams / pillow cases separately?" Unfortunately, these are not available. "Does it fit a queen sized duvet correctly? I ordered another one that was full/queen and it was too small for our queen sized bed. " The F/Q size is 90 inches x 90 inches. It should fit a queen size comforter with no problems. "I need this in twin size for a daybed, so I'd like two pillow cases but twin only comes with one. Can I buy a second separately?"